"This recipe was given to me as part of a wedding gift recipe collection from a very dear friend. It is rich, aromatic, flavorful and makes A LOT. So please grab the biggest pot you can find. I mean REALLY BIG. Extra sauce freezes well for future pasta dishes." 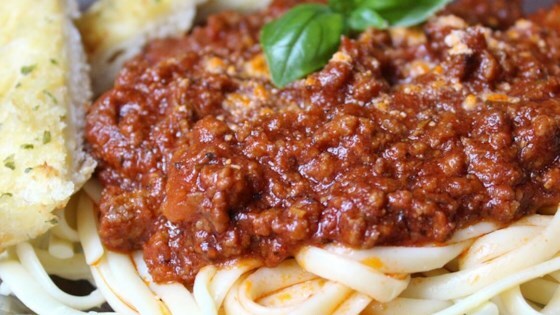 A flavorful and rich spaghetti sauce! Followed recipe except I used 1/2 # mild and 1/2 # hot sausage. Great sauce. This will be my go to recipe! When I make again, I will double! Thank you, thank you! !